Judy Glockler : Unparalleled Expertise. Extensive Area Knowledge. Unmatched Marketing. A career-long, award-winning real estate Broker, and a third generation Chicagoland native, Judy has been successfully working with buyers and sellers in the Chicago suburbs for four decades. 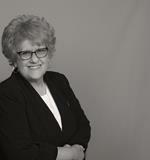 She and her group are proud of their industry-leading, high percentage of happy repeat clients and referrals. They are also often commended on her extensive marketing (with a professional, Northwestern University-trained Marketing Director, working solely with her), real estate expertise and market knowledge, tech savvy and ability to really work with first-time home buyers, experienced home buyers and sellers every step of the way. Judy is proactive, creative and dedicated. She started a local REALTOR® networking group years ago where Agents tour each others’ listings to preview and promote them, also getting other broker opinions, which sellers, brokers and buyers enjoy. Judy also works with new construction builders…and has for most of her career. Also important to her is giving back to various causes and she contributes a portion of each sale to the Coldwell Banker Charitable Foundation. Coldwell Banker Residential Brokerage is the premier real estate firm: #1 in Chicagoland in closed volume and closed units. …is within the Top 1% of Agents nationwide and is in the International President’s Circle, among the Top 4% internationally qualified. …has repeatedly received numerous awards and distinctions throughout her career, such as Saleswoman of the Year, #1 Agent in Office and #1 Team in Office. …is a Chicago Magazine Five Star Professional – less than 2% of Agents in the area rated highest in overall satisfaction by clients, peers & industry experts. …was one of only three in the suburbs & only one in the region, nominated by her peers as MVP, Suburbs and more! For more information on your local real estate market, homes for sale and more, contact us today!